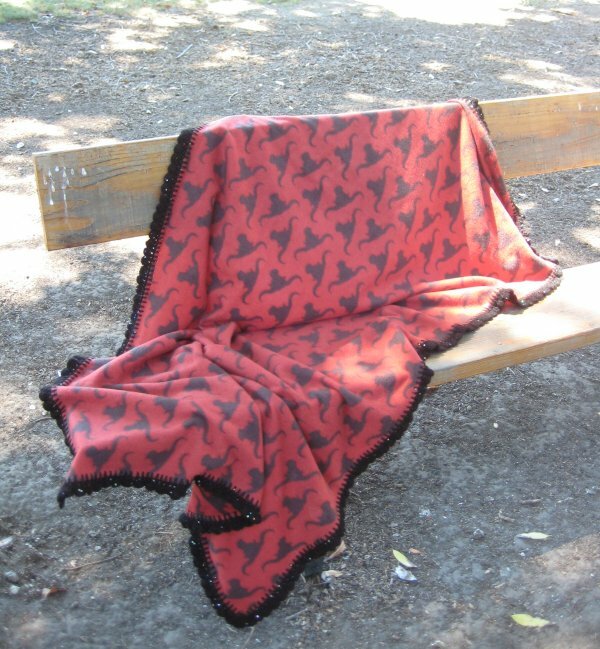 Fleece blankets are one of the quickest gifts you can make. Fleece comes 60" wide, so all you need to buy is the length that you want. I was rummaging through my local Joann's remnant bin when I discovered this Texas longhorn fleece. I have friends in Texas who have a 7 year old boy ... the remnant would a *perfect* size for a young boy. It'll be great when he's sitting on the couch, watching TV, or sitting in the car and just needs a small something to take the chill off of him. Fleece doesn't ravel. And although you COULD just toss the fleece yardage at the recipient and call it "done", I think that's an unfinished blanket. Most of the time, I have bound the edges as I would bind a quilt. But recently, I discovered a Skip Stitch rotary cutter. Instead of a continuous straight line cut (as normal rotary cutters do), this one has notches all the way around the circumference of the blade. When you use this blade, it produces a "perforated" line. And why on earth would one want a perforated line? Glad you asked! Because .... if you want to crochet an edge around a fleece blanket, you have to create holes for the crochet hook to go through. (The fleece is sufficiently dense that it's a Real Pain to try to make the hole with the crochet hook itself). It looks nice if the holes are a regular distance apart. When you are making the holes yourself, unless you pre-mark the hole locations, it's very difficult to make those holes equi-distant. BUT .. the Skip Stitch rotary blade makes all of that child's play! You run the blade 3/4" away from the edge of the fleece and voila! you have evenly spaced holes. You fold the edge of the fleece over and crochet your foundation stitch. It's so simple. Caution! The Skip Stitch blade is a SPECIFIC brand, invented and sold by a lovely lady in Georgia. 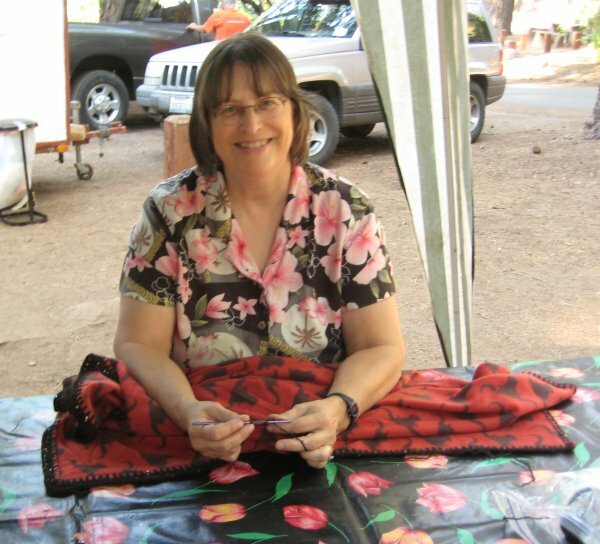 June Tailor makes a competing blade, but I have been told by a Project Linus coordinator (and a quilt shop owner) that the June Tailor blade does NOT work well. Forwarned is fore-armed. 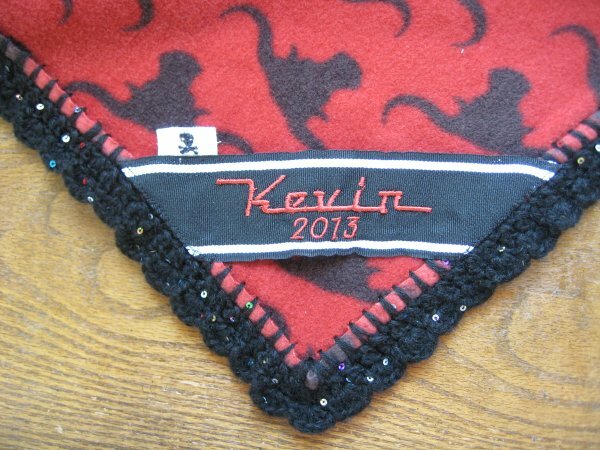 I had on-hand some black grosgrain ribbon that I used as a label for the blanket. Most of the time, I machine embroider directly onto the fleece, but this time I decided to change it up. The font I used is Hood Emblem from Sew Weird. Working on the edging for this blanket was one of the projects I took with me on our recent camping vacation.